On Oct. 28, 1949, Jim Elliot wrote in his journal a statement of faith that has inspired all who have read it in the decades since: “He is no fool who gives what he cannot keep to gain that which he cannot lose” (The Journals of Jim Elliot). Seven years later, Jim Elliot and four other missionaries indeed gave their lives in an attempt to share the Gospel with an unreached people group called Aucas in Ecuador. This indigenous group called themselves “Huaorani,” meaning “people,” but their enemies called them “Aucas” because they were “savages.” They were a tribe of about 600 people known for their violence, not only against their enemies but also among themselves. Any foreigners (cowodi) encroaching upon the Aucas’ territory were killed. Despite the Aucas’ reputation for violence, five missionary couples felt compassion for them because they had never heard the name of Jesus Christ, the Prince of Peace. They were Jim and Elisabeth Elliot, Nate and Marjorie Saint, Ed and Marilou McCully, Pete and Olive Fleming, and Roger and Barbara Youderian, who, along with their children, moved to Ecuador in order to learn the language and customs of these primitive people and to establish contact with them. Nearby lived Nate’s sister Rachel, who also had a heart for the Aucas. A breakthrough occurred when an Auca girl, Dayuma, fled from tribal violence and found refuge with Rachel. From Dayuma, the missionaries learned some phrases that they hoped would be helpful in their early contacts. Next, Nate Saint, who was a skilled pilot, discovered the Aucas’ village from the air and, using a megaphone, called out, “We like you. We are your friends.” Nate learned a technique called the “spiral line” by which he circled his plane while lowering a bucket so that he could deliver gifts, such as machetes, axes, pots, and ribbons, to the Aucas. In return, the Aucas began to place into the bucket their own gifts, which included a parrot that became the pet of Nate’s young son, Steve. Believing that these interactions indicated friendliness, the missionaries decided it was time to make contact. New Year’s Day 1956 was the day for the five missionaries to prepare for the upcoming attempt to contact the fierce Auca Indians of Ecuador. 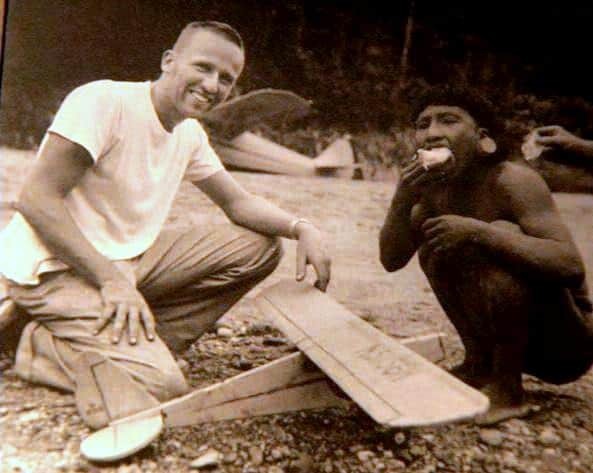 Nate Saint, the pilot, was going to fly them to Palm Beach, the nickname for where they had previously exchanged gifts with the primitive Auca tribe from the air. As the men collected what they would need for their mission, Betty Elliot, Jim’s wife, wondered, Will this be the last time I help him pack? Thine is the battle, thine will be the praise. Victors, we rest on thee through endless days. Once on the beach, they built a tree house for safety and prepared to contact the Aucas. On Friday, January 6th, a visit from an Auca man and two women encouraged the missionaries. They spent several hours together and even gave the man a ride in the plane. When 4:30 came, the missionary wives switched on their radios. Five minutes went by and then ten. Sundown came, and still no word. The five wives slept little that night. By noon a ground party was organized to go to the site. On Wednesday, Johnny Keenan made his fourth flight over the beach. Marj Saint, who had hardly left her radio since Sunday, called the other wives, and as soon as she was able to speak, she said, “They found one body.” Johnny had seen one body floating face down in the river. The five wives had no idea whose bodies they were. The search party located four of the five bodies, but Ed McCully’s had been swept away by the river. The other four were buried on Palm Beach. An actual photo taken by one of the five missionaries. What happened to the Aucas? By the end of 1958, Betty Elliot and Rachel Saint, Nate’s Sister, were living among them, and one by one the Auca warriors and wives put their faith in Jesus Christ. Betty Elliot went back to minister to the very tribe which killed her husband and took their daughter Valerie with her. The five Auca men who murdered the missionaries became not only Christians but also spiritual leaders among their people. After they believed, they shared how on that fateful day they heard singing from above the trees. Looking up, they saw what appeared to be a canopy of bright lights. God was welcoming his children home. Learn more about the complex tribal politics, only understood years after the fact, that led to the murder of Nate Saint and the 4 others. The missionaries unwittingly became involved in a bloody family vendetta that had been taking place at the time of their arrival. Such killings were not unusual in the Waodani tribe, where there was a 60 per cent homicide rate. To read more about the ongoing ministry of the Saint family, visit their website here. All text taken from pages 18 and 19 of E. Michael and Sharon Rusten’s chronicle titled, The One Year Book of Christian History. “Lord, I put my life in your hands. We just watched Beyond Gates of Splendor on Netflix the other night. We were very familiar with their story but it was beautiful and heartbreaking to see it again. My husband grew up as an MK in New Tribes Mission – the mission mentioned in the film that had lost 5 men in South America in 1943 – Jim, Pete, Nate, Roger and Ed read the stories to try to learn from what happened there to avoid it possibly happening again. A story that never loses its powerful appeal~one of the most enduring times I ever spent in church was when a missionary brought back natives from Papau, New Guinea that had come to know the Lord and they shared their testimonies and songs in their native dress. It so reminded me of heaven as we worship with them during the service–“from every tribe and tongue” will be those gathered around the throne. Such and incredible story…and I so appreciate you taking the time to remind us.